It’s In the Air – Let's Paint Nature! I can feel it. I even heard it this morning when I woke up…the birds are calling! Yesssss! Hello birdie outside my window. We are having a little taste of warm weather for the next few days and it is welcomed. Right now it is already 62°F how wonderful. I know it’s too early for monarchs but after months of painting winter scenes, I just had to paint something spring-like. This little watercolor painting was gifted to my friend Spaz. Just because. Your painting is more appropriate than you might think! 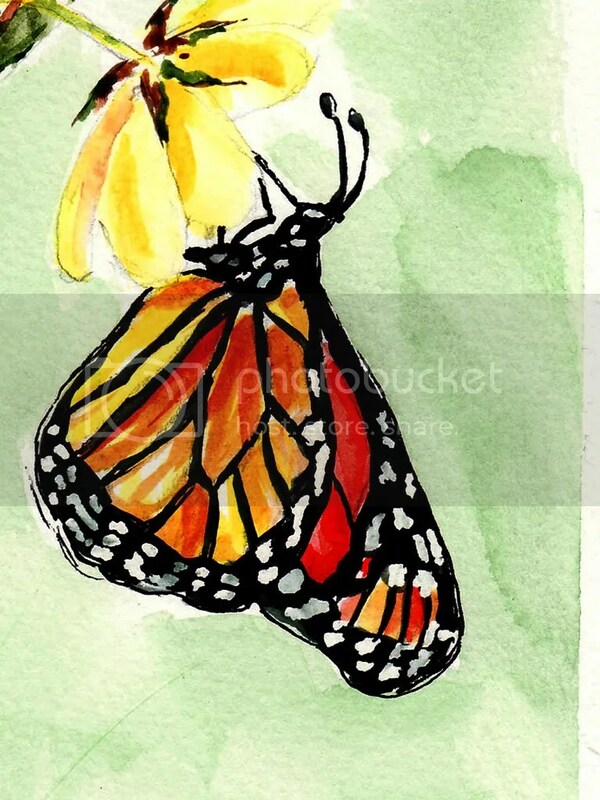 You may not be aware just how timely your post and painting are but as we speak, the Monarchs are poised to leave their wintering locations in Mexico and begin their amazing migration back to the northern US and Canada at any moment now. Here is a site where you can read and follow their journey…. Also, if you have never watched the Nova special aired on PBS, “The Incredible Journey of the Butterflies” you need to watch it. You can watch it on-line at the link below. It is about 50 minutes long and is broken up into about 6 chapters. The fact that it takes “1” generation to migrate in the fall from Canada to Mexico, some 2000 miles and yet it takes “3” generations to complete the return the following spring is absolutely mind-boggling!